Sabbatical 2012 [Days 10-11] Montevideo. North Eastern Block. 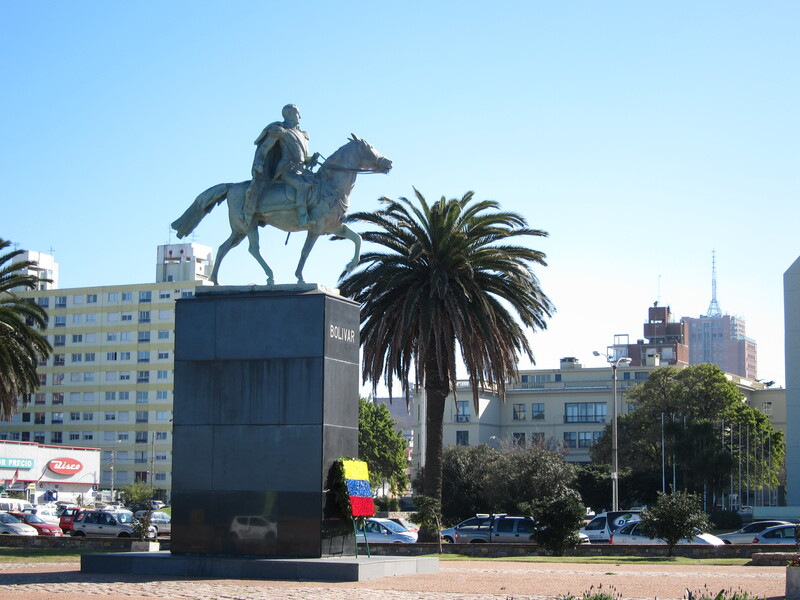 From Colonia, Montevideo is best reached by bus. The bus line was quite nice – featuring comfortable seats and even had wi-fi on board that had a better connection than our Bed & Breakfast. The ride is scheduled to be about 2.5 hours. I was expecting this would be a fairly direct route, but we seemed to stop in places that didn’t even have a town. Just random spots on the highway along-side farms. The landscape passing by gave us a demonstration of many farms, cows, horses, pigs, and pretty much every kind of pastoral view you could imagine. Again, it felt like driving through Ohio – except with random scatterings of palm trees along the road. The landscape didn’t align with these palm trees or vineyards, but somehow it all fit together in its own way.We got to Montevideo in the scheduled time without any issues. 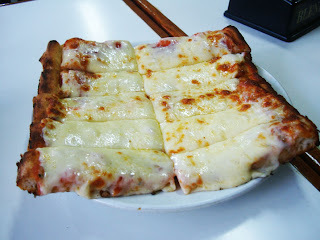 The first food I wanted to try in Montevideowas the pizza. 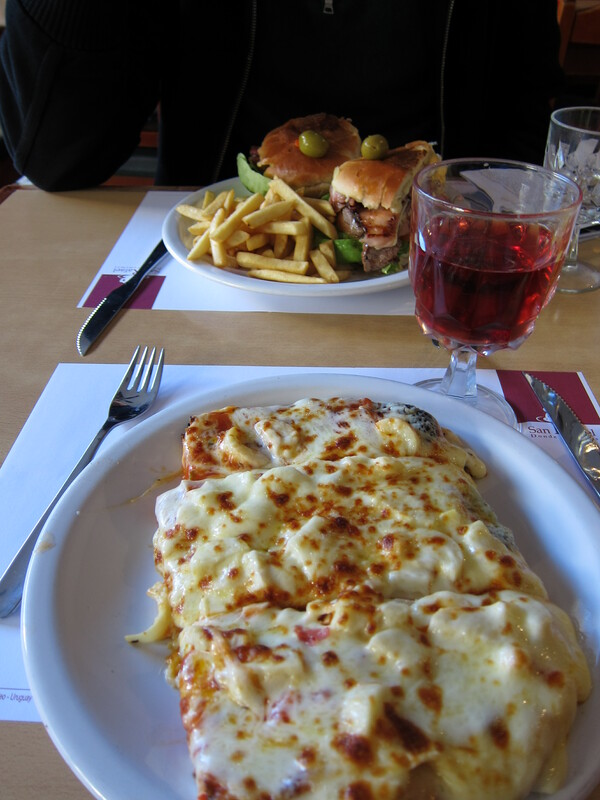 This is largely in part due to Christine Hebl’s blog about their trip to Montevideo, and how they stumbled into a place and ordered pizza that looked funny but tasted good. Well, we actually sought out pizza, but the first place we wanted to eat was closed, so we wandered to the next restaurant which also had pizza and looked almost exactly like what Matt & Christine had ordered. It was indeed quite delicious – almost like a giant cheesy bread. Alex got a sandwich which he said was amazing. 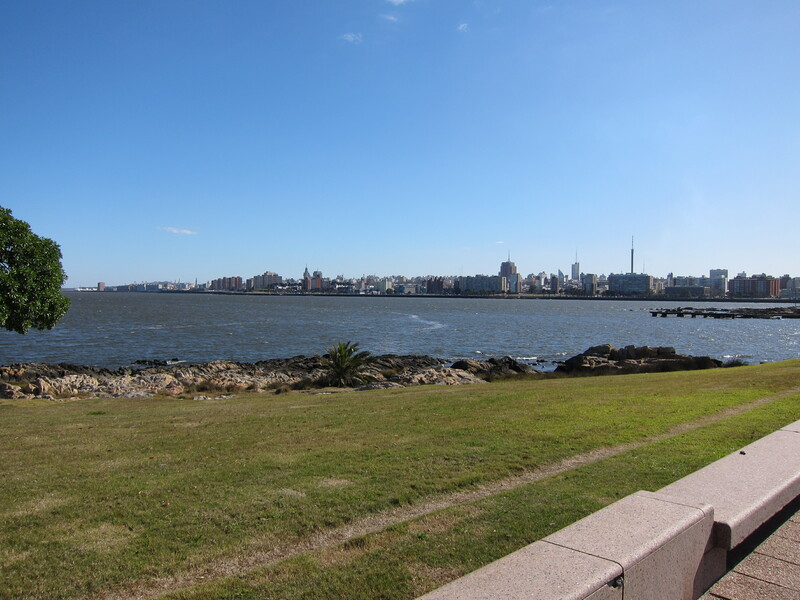 Alex noted that Montevideo felt like the Eastern Europe of the region. Perhaps it was like coming to Ljubljana after visiting Milan. It was quieter, cleaner, people were friendly and seemed slightly less stuck up than their Buenos Aires counterparts (not that wee have any complaints about people in Buenos Aires!) The buildings are shorter, and there are lots and lots of monuments dedicated to heroes and politicians of various sorts. In centers of Plazas. Mounted on horses, of course. 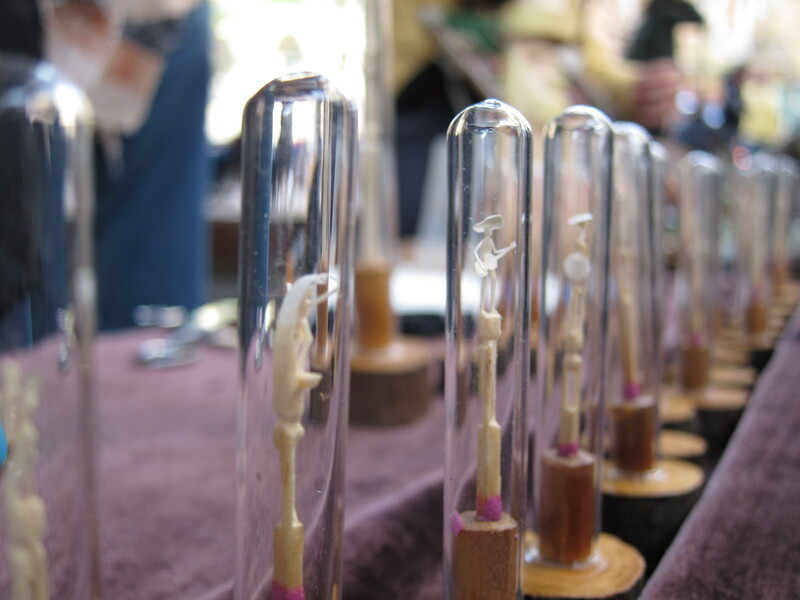 There are also lots of naked baby sculptures. 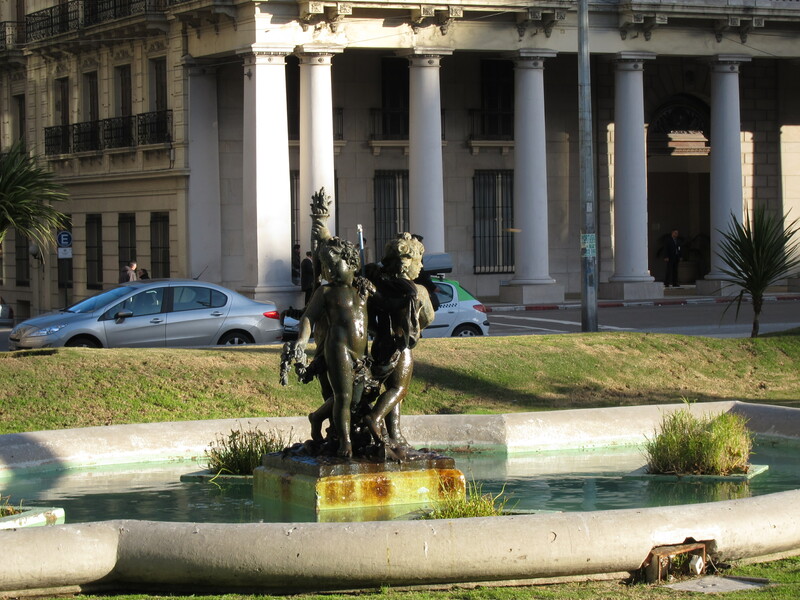 We noticed was that you definitely feel much less enclosed in Montevideo than Buenos Aires or Santiago. For instance, from the road our hotel was on, we could look straight down the road and see the ocean. If we walked the opposite way up the road, we’d reach the main street which seemed to run along the highest point of the peninsula encasing the old part of Montevideo – the “barrio historico”. If you walked across that street, you’d see the ocean on the north end of the peninsula. Even if you got lost, you couldn’t get too far. Navigating this city was thus quite easy. You have clear boundaries (water) which are visible from most blocks, and you knew whether you were heading to or away from the water based on the slope of the road. Roads were given pretty simple one-word names and were clearly marked. The signs all featured about a 3” strip of advertisement space across the top. Usually it was purchased by some cell phone carrier, but occasionally, you’d see something like “Pizza 2039-2927”. Mmm, generic anonymous street sign pizzaria. Doing our initial walkaround of the city, we finally saw some guys with machine guns standing in front of a bank, and they even had a chaser car for the bank money collection. Unlike most men carrying machine guns, these guys were all smiling and almost giggling the whole time at their own job. Its as if they thought their purpose was somewhat overkill, and they smiled like “Yeah, we’re Ocean’s-11-awesome”. 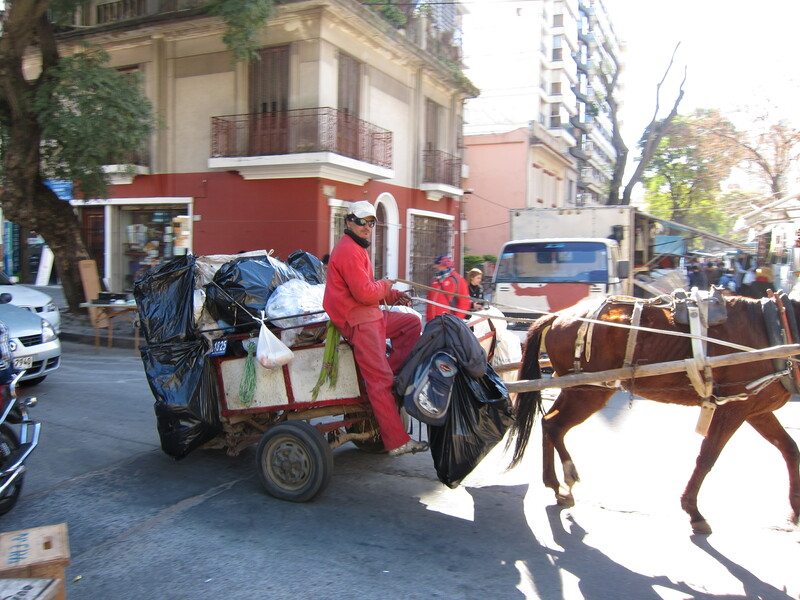 We also saw lots of horse-drawn… garbage trucks. The following day, we woke up and got some food. I hated my omelette, but Alex liked his. We walked the Rambla on the southern shore of the peninsula. Originally, we hoped to go for a jog down this stretch but it was freezing cold outside and neither of us were too excited about running in the cold sea breeze. The views were nice, the beaches deserted, and the number of people jogging were surprisingly few for a city that size. We walked to Pocitos beach, which was a decent hike, then back in towards the city where we found an open-air food market in the middle of a street. There were some gorgeous houses along the main avenue which I very much enjoyed walking along. Until I was too tried, and it was time to take a cab back to the city center and sit in a café for a while. 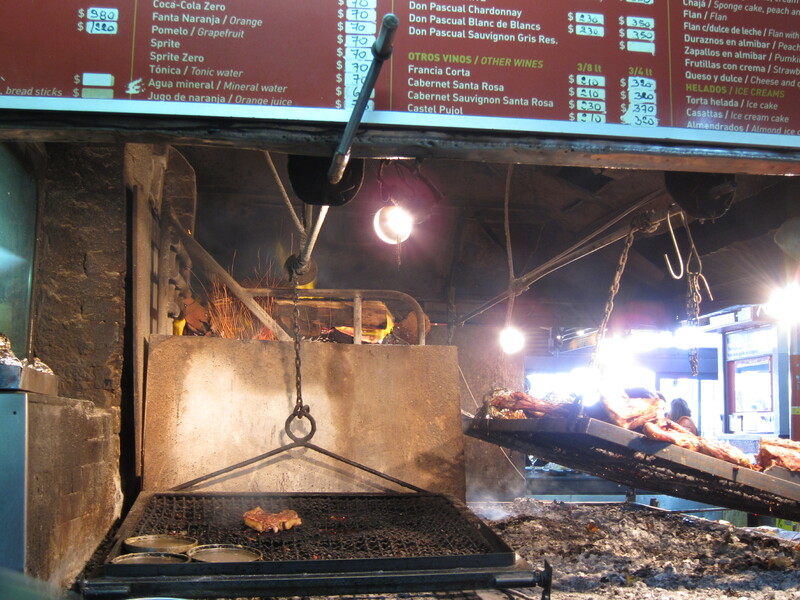 We headed to the market by the port, which wasn’t so much of a market as it was a giant building stuffed with lots of Parilla restaurants, all serving basically the same meats cooked on open fire flames. Alex couldn’t resist, and ordered a half-size plate of sausage. The waiter/cook was delited to have us there, and asked us where we were from, and gave me a free plate of French Fries because he felt bad that I had nothing to eat while Alex was trying the meat (I didn’t mind). People are really so nice. As much as I don’t care for meat, the parilla was an interesting thing to view. They had an amazing system in place for grilling meat – I’ve never seen anything quite like it. 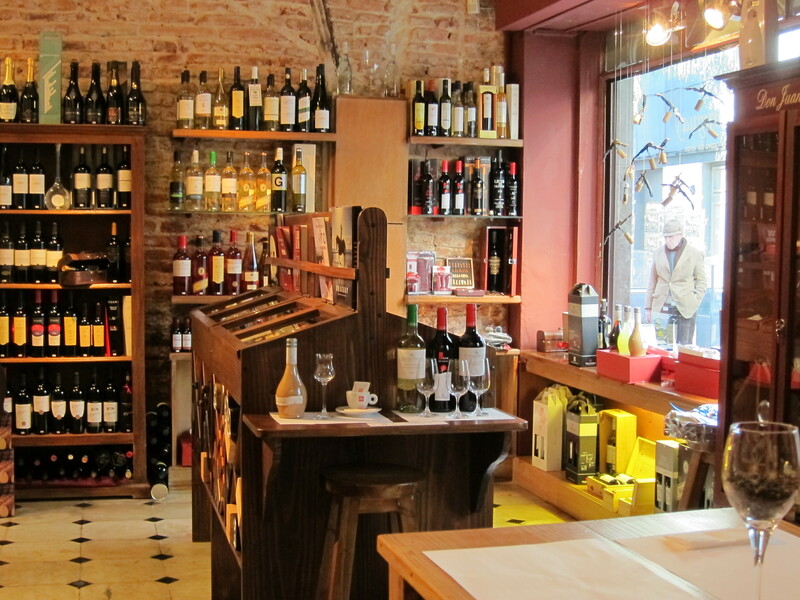 Walking back to the hotel, we came across a little wine store that looked like they may do wine tastings. Why not? It ended up being a fantastic experience. There were two very nice women working at the store, and the one giving us the tasting set up a little plate of bruschetta for us to have with the wine, and some chocolates to try with the liquors. The wines were an amazingly different Sauvignon Blanc which had far more fruity notes than I’ve ever had in a Sauv Blanc. The red was some hybrid varietal between … Petit Verdot (I think?) and Merlot. It was chocolaty, tannic, and delicious. The liqueurs we tried were a tannat liquor – similar to port, and a dulce de leche liqueur, similar to Bailey’s but without that funky finish. Everything was superb. Service was great, and we learned a lot and had some good laughs with the ladies. We were talking about Uruguay, and the small population. She said they needed more people – and if we knew anybody looking for a country to live in to send them to Uruguay – they’ll happily take them, even pay them to immigrate. Perhaps Uruguay should post ads along the US/Mexico multimilliondollar border and provide a free cruise that departs from the Rio Grande. I can’t think of anywhere else that may have lots of immigrants looking for an ideal place. Similar great conversation was experienced at our hotel, Hotel Iberia. The owner was so friendly and funny. We chatted with them for some time before Alex went off to grab even more BBQ with his friend from middle school in Saudi Arabia. I had leftover gnocchi from the night before, and sipped some Tannat in the hotel, occasionally chatting with the hotel employees. It couldn’t be more enjoyable, really. Back to Buenos Aires for a single night before we head off to a flight to Rio de Janeiro. Time to practicar o português para falar muito bom. Uff, this is going to be a bit more challenging, linguistically! 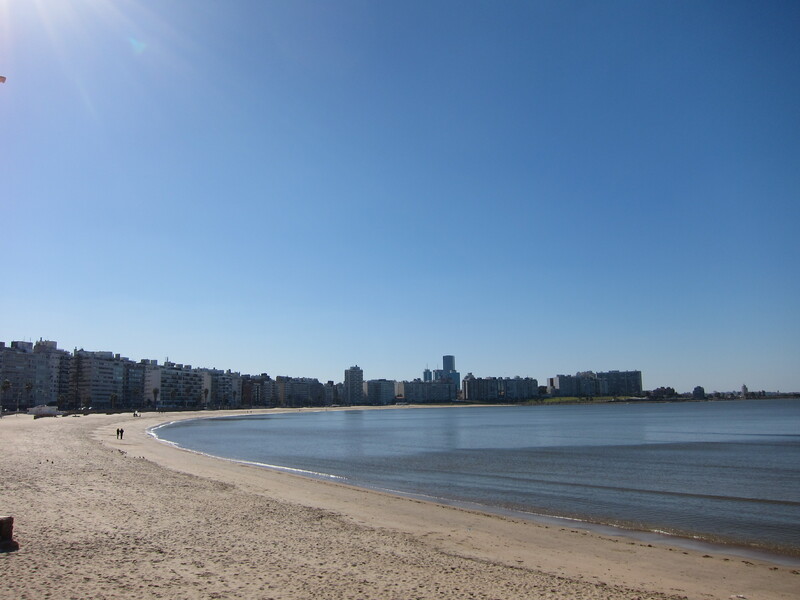 Thanks to Pluna – we really didn’t have many options for flying out of Montevideo to get to Rio de Janeiro. So, we had to return by boat to Buenos Aires. This was not by any means a bad thing, as Buenos Aires was an awesome city. We were also excited to stay at a different part of the city – Palermo. The ferry ride from Montevideo is quite a bit longer than Buenos Aires to Colonia, as it is basically at the opposite end of the bay. The ferry is also a lot smaller than the Colonia ferry, but also quite fast. 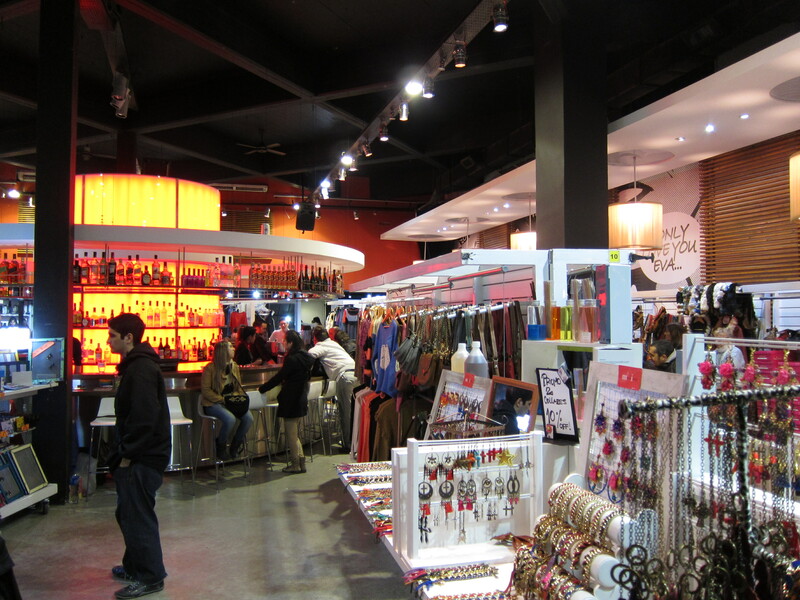 Rest assured, despite its smaller size, it too has a duty-free store and also smells like perfume. It also has a small cafe where I discovered that you can buy the most disgusting tortilla (as in Tortilla Española) with spinach and about 1 cup of salt, pre-packaged in a plastic container left to sit in its sulfery awfulness. Two bites of that and I threw it away. We get back to Buenos Aires. Ah, so familiar. Cab it to Palermo… wait. What is this place? Its completely different from Recoleta, and any of the parts we had walked through. Really, it is like we just arrived at a new city. Palermo, unlike its above-ground-cemetery and walking-zombie-lady neighboring borough, has much shorter buildings that seem to be kept in very good shape. The streets are much more quaint, and have lots of interesting little cafes and restaurants – which is of course expected at this point from Buenos Aires. But they’re just a bit more chic – a bit more quaint, and the clientel is a LOT more attractive. Money and beauty may be synonymous in some places. 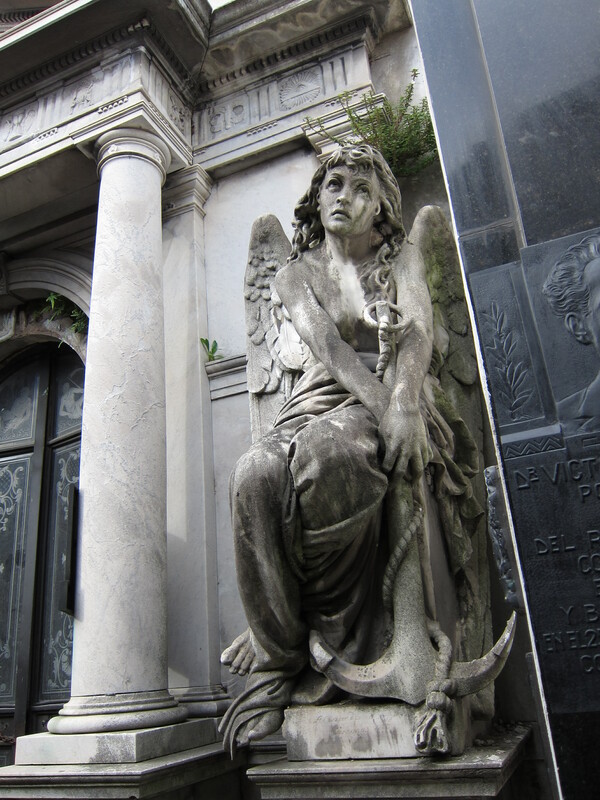 But, maybe Palermo just attracts a different kind of person than Recoleta – like the kind of person who… doesn’t like living by a huge creepy cemetery. 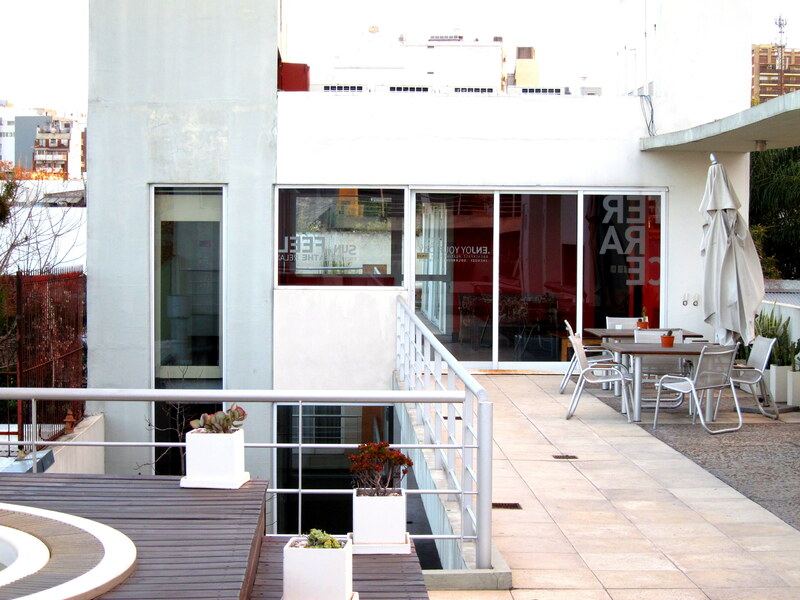 Our hotel, “Five Cool Rooms” – which sounds less like a hotel and more like a sequel to a Tarantino film – was substantially nicer than the Ayres Recoleta in every regard. It was hard to spot from the street because its only facade was a door and a small sign. Once inside, it opened up to a nice, chic glass-enclosed courtyard, with no street-facing rooms. It was quiet. It smelled amazing. The beds were the most comfortable we’ve had yet on the trip. Shame, really, that we didn’t stay there to begin with. They did outright lie to us about the hot tub working, though. Not having good food on the boat, we were both quite hungry and grabbed some food at a cool café. Palermo even has bars in their stores. Now that is how to shop! We walked around Palermo, realized that we needed more money from an ATM, and thought we’d go find a bank for an ATM. Simple, right? We’re in a major, well-off part of town. No, not simple. We walk to the main drag, and there are no banks. Turn around and walk further down, no banks. It was baffling. I don’t even remember when we found a bank, but it took us nearly 30 minutes of walking to find a bank, and another 10 to find one which would accept foreign cards. Time to spend that money on drinks. On a terrace. With a nice view of a square. Complete with obnoxiously slow service that we’d come to expect at this point. Lesson learned. Next time, stay in Palermo. A nice way to end our 2nd visit to Argentina. But bring money. Don’t cry for me, Argentina, we’ll be back in Iguazu in just a few days after hitting up Rio de Janeiro. After several days in large cities, it was time to do something a bit slower paced. 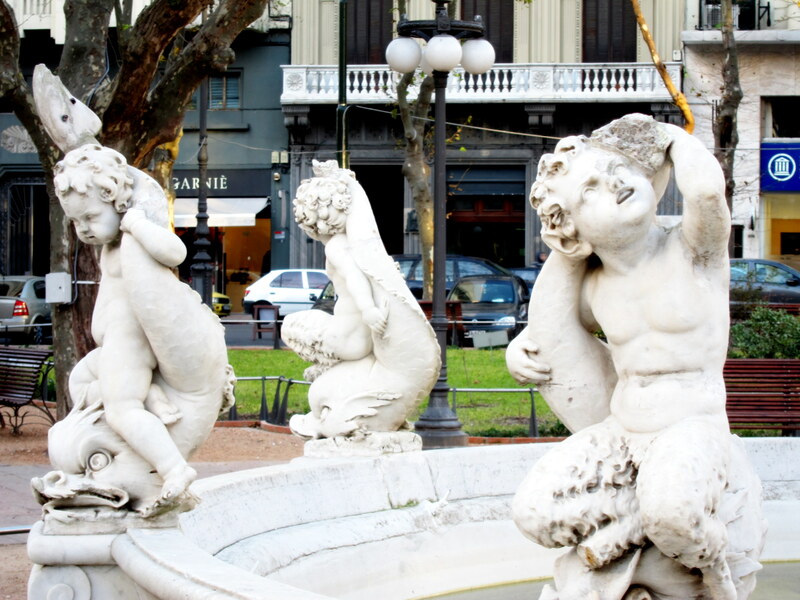 Why not head to another small UNESCO town in Uruguay? Colonia de Sacramento is located along the southern Uruguayan shore, about 2 hours across the bay from Buenos Aires. There is a high-speed ferry that gets you there in about an hour. The ferry station in Buenos Aires was immaculate and modern – and featured all of the luxuries of an airport, including baggage checking and duty-free shops. Unlike an airport, there is one major difference – customs and immaculate are taken care of before you even board the boat. I actually much prefer this method because usually the last thing you want to do when you first arrive in a new country is deal with their bureaucracy and paperwork. The ferry was fast, comfortable, clean, and featured its own large and quite popular duty free shop. The ferry thus smelled like a perfume store. We got some hot beverages and Dulce De Leche chocolate snacks. We arrive. We get a cab to take us the whopping 4-5 blocks down the street which had recently been renamed from “Florida” to 15-something-syllables-too-many of a person’s name. It was definitely a change for the worse. We got to our Bed & Breakfast, El Viajero. 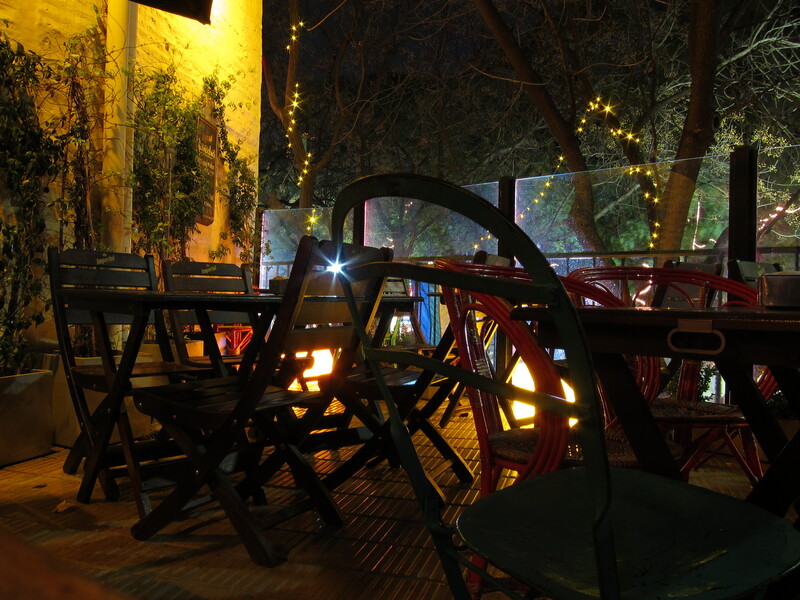 The staff was very friendly, the location was super quaint and inviting. This is exactly where to go to catch a break if you’ve been staying in cities where you can’t see the horizon. I’ve come to realize that “UNESCO Heritage Location” really just translates to “photographer’s dream-town”. It is virtually impossible to take a bad photo in one of these cities. Even the cliché photographs such as staring down at your feet are totally acceptible, because you know what? Underneath those feet are 600 year-old cobblestone roads. Look at the texture! How many photos can we take of windows offset to the side with a nice dooorway in a semi-colorful stucco-walled home? The answer is lots. How about some photos of the lighthouse? From the lighthouse? Oh look, some dogs sleeping and rolling around in the sun! An old fisherman on the pier with the sun setting behind him over the bay. A cat hiding in the breakwall. An old trailer. A trailer being loaded with chopped wood to fuel a parilla grill in a restaurant. Finally, its dark, and now foggy. Look how the light streaks across the plaza? A loose horse that is roaming around the park next to the shore. Every 30 seconds brings a moment begging you to click the shutter. And you do. Colonia is like a drug that takes over your body and controls your eyes. Combined with a camera, it is a dangerous place. It almost felt scripted, as if a photographer or director had set everything up just right for the ultimate visuals and timing. Editing photos and selecting the best ones becomes the biggest challenge. We wandered around at night to find a place to eat, and it was much like wandering around Burton at midnight, except that people were actually out – sort of. Restaurants were packed and lively, but the streets were desolate and silent. The air smelled like burning wood, and reminded me of Christmas time in Burton. It was eerie after coming from Buenos Aires – where people were constantly walking the streets. It was a welcome change, though, and we were greatful to be able to take a breather and catch up on sleep before heading off to the largest city in Uruguay the following day – Montevideo. Our plane emerged from the layer of smog engulfing Santiago. It ascended, and ascended, and ascended, probably just quickly enough to avoid running into the incredibly high Andes mountain range immediately next to the city. LAN came to our rescue, for a price, and agreed to get us to Buenos Aires for a slightly steeper cost than we had originally paid on Pluna [insert curse word here]. I think we have a return trip to Santiago, should we want to totally change plans and return. We were now flying off to Argentina – land of cows and funny “J” accents. Buenos Aires is an enormous city. You could see how expansive it was from the air, but even more-so from a satellite map. It may not be quite as big as Beijing or Mexico City, but it is up there in expansiveness. None of them are as horrifying from above as the wasteland of suburbia in the desert that is Phoenix (and its greater area) though. Our plane landed. Immigration was a breeze, despite me fearing that I’d have to pay a ridiculous importation tax on my personal goods. Nobody even collected the customs documents from us. Our baggage was waiting on the carousel before we even got there. So far, quite a great experience flying into the country. Still no guys with machine guns, though. Perhaps someday. Even flying over the Buenos Aires outskirts, you could tell that the city was in a bit rougher shape than Santiago. Roofs were in need of repair, yards were unkept, and things just didn’t seem quite as tidy. Once we got to experience it ground level, this was largely confirmed. Dirty streets, everything needs a paint job, there is litter and garbage along the crumbling sidewalks – and yet still, somehow, the streets were more enjoyable to walk than Santiago’s. When we first landed, the air still had a slight haze to it. It still smelled smokey. I thought this was Buenos Aires? That translates to “good airs”. I mean, come on, they had to pluralize “airs”, so there should be an abundance of these good airs, right? Not again! Then it started to snow. Oh, it is just winter! Ok, this white stuff isn’t fog, its snow! Cool, that makes sense. No, wait, whats that cloud coming up from the ground? Oh, its a huge thing on fire. Those aren’t snow flakes, they’re ashes falling back onto the highway like a blizzard. Alright, this makes sense. 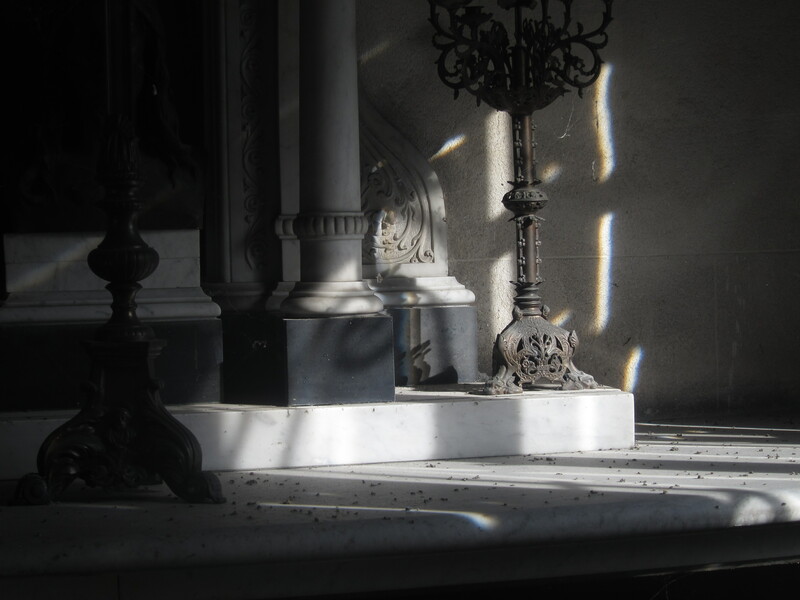 10 miles or so away from the plane crash or house fire or whatever that was, the aires did indeed become buenos, and we had arrived at our hotel, Ayres de Recoleta. Looks swank, right? Don’t be fooled. 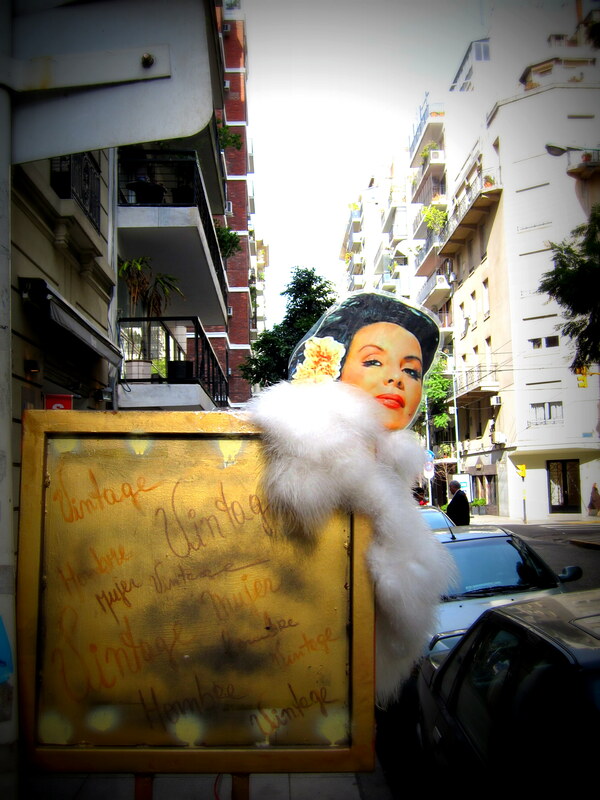 Ayres de Recoleta has some incredibly great advertising, and looks very chic on their website. Entering the room, however, yielded something a bit less true. No matter how we photographed the room to show what it actually felt like, it looked gorgeous in photos. How could a hotel be so photogenic but so drab in real life? Three words. Brown corduroy bedding. 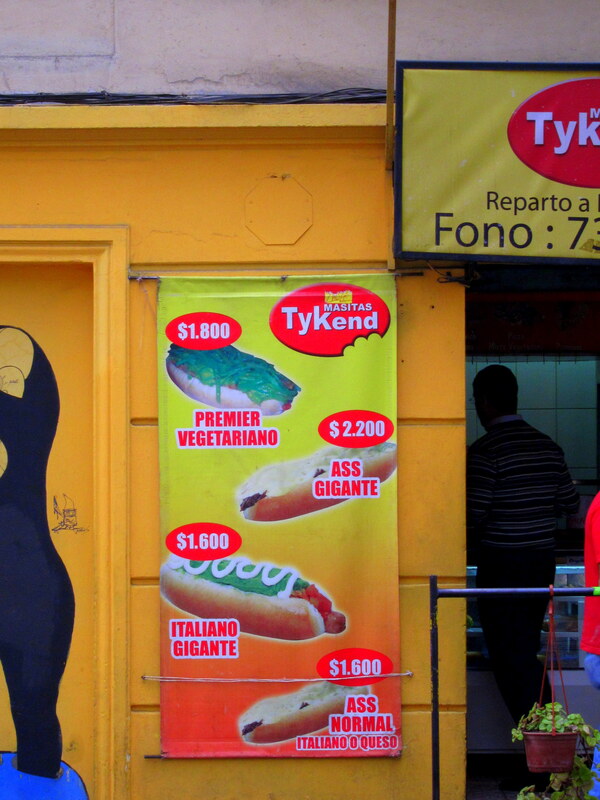 There are no hot dogs in Buenos Aires. Ok, that is probably a lie, but I’m fairly confident that there is not an entire square of hot-dog stands selling “completo salchichas” anywhere in this city. Lets keep it that way, shall we, Argentina? Alex and I wandered around trying to find a restaurant. First mistake – it was about 7:00pm or so – way too early. Nobody was eating. Its impossible to tell which restaurants are tourist traps with bad food, popular local restaurants with bad food, popular local restaurants with good food, or perhaps the ever-so-rare tourist trap with good food when you don’t have Yelp, Google reviews, or even people already out dining to show a percentage of total table occupancy. So, what do you do? You walk. A lot. And then you walk some more. And then you go back to the best restaurant you passed after walking for 20 minutes in figure eight’s around the city blocks. When you’re nearly 30 years old, you have to contemplate about the restaurants that are incredibly popular among the senior citizen crowd. Perhaps they have great taste? Maybe its more authentic? Or, maybe it tastes like Denny’s or Bob Evans. Regardless, the eye candy will be assuredly slim. I had originally written a paragraph here that, several years later, I had myself found to be disturbingly offensive, over-generalized, sexist, and ageist. While trying to be funny and point out superficial differences in how Argentine people (ashamedly, primarily targeting women) age compared to the rest of the world, I wasn’t very considerate. My sincerest apologies. In more recent years, I have become much more acutely aware of gender norms, stereotyping, and unfair societal expectations of women. Removing the original paragraph is best for the internet. Completely erasing the history and progress is not. Self-awareness and personal growth is a good thing worth marking. Wear Sunscreen. Eat Vegetables. Don’t Smoke. I think that can do nothing but good. Only time will tell how it works for me. The thing we later found out about the senior citizens is that they’re incredibly smart when it comes to scheduling their dinner. They get there right before the restaurant gets incredibly packed and then forms a line or is reservation-only. Early bird gets the worm, as they say. 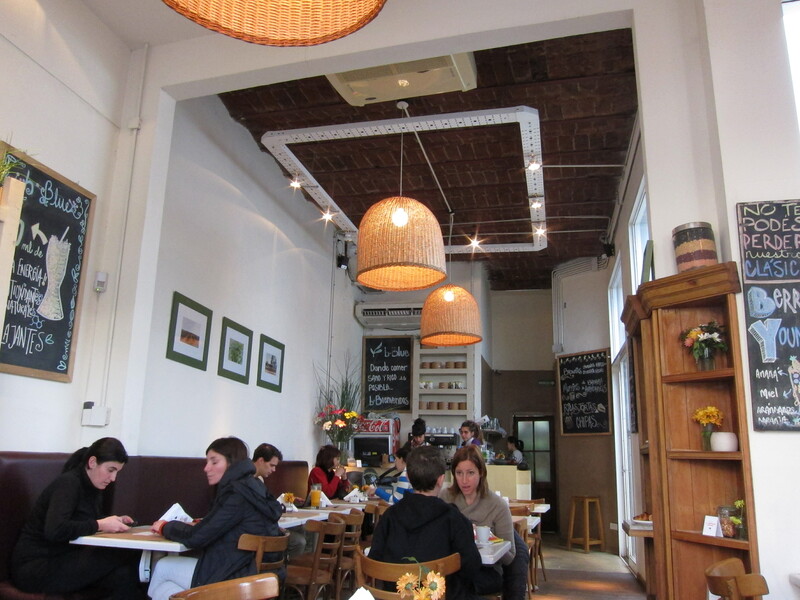 The first restaurant we tried had several regional cuisines from all over Argentina. Our waitress was incredibly helpful in our ordering. I had something that had large kernels of corn, mixed with vegetables and cheese and Argentine goodness. It was already better than Santiago’s food. For dessert, we got this amazing multi-layered cake with Dulce de Leche, some nuts, flan, chocolate… pretty much everything you would want. There are empanadas everywhere. Not like the soggy ones we got in Santiago (and I threw away), but perfectly crispy crusts and delicious interiors with fresh ingredients like Roquefort cheese, nuts, spinach, potato, sweet flavorful onions. I could live off of empanadas. Oh, and they’re like $1.50/each. How about that? Wine was also fantastic. We had the fortune of trying a new varietal called Tannat, of which I’ve never heard of before. The first bottle we got was really tart, almost like wild berries. It was unlike anything I’d had before. I guess it is unique to this region and Uruguay. I hope to find some bottles of it in the states. If you ever happen to come across a bottle, give it a go. There are bakeries on seemingly every block. Each one displays its array of pastries in a case. It is difficult to not do a tour of the city just eating pastries. And then, if that isn’t enough, you have cafés on nearly every block as well… maybe 3 per block. Maybe 6. There is even McCafe. 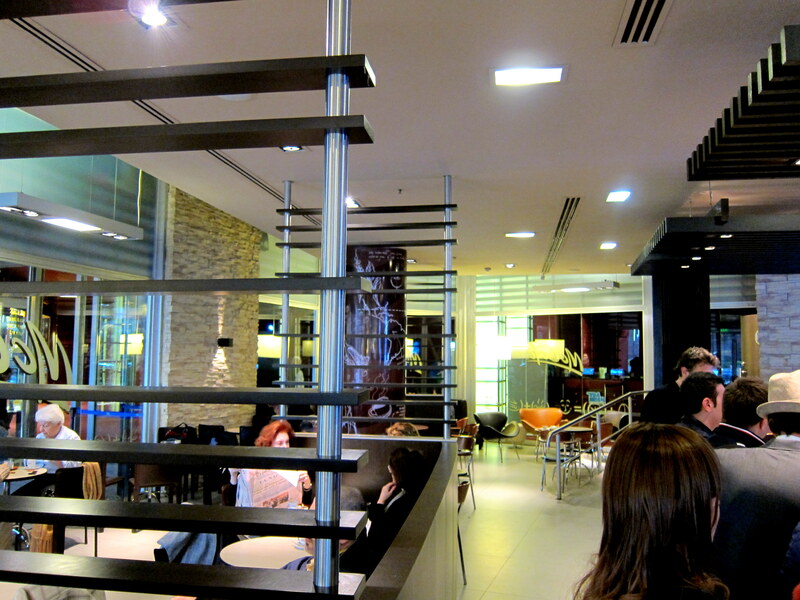 Yes, McDonalds’ has entered the café market in Buenos Aires – and they do a hell of a job with the decor, presentation, and quality. There was nothing fast-food feeling about this joint. I’d almost call it prestigious. Impressive, really, for a company like McDonalds. Then there is Yerba Mate. It would seem that no matter how much we walked and how hard we tried, we could not buy a cup or drink in any mate in a cafe. It would seem that it is something to be prepared only at home, in your own personal gourd and bombilla. Even when we went to buy the yerba leafs, the lady in front of us picking out her package of mate seemed to be very secretive about it. I had heard that many people are very addicted to it – more-so than coffee drinkers in the rest of the world. Perhaps they are embarrassed about their addiction. The mate aisle then sort of felt like the condom aisle in a grocery store or pharmacy. Shame. Embarrassment. Everybody has their preferred brand but nobody wants anybody else to see them picking it or getting it. Then again, I’m basing this entire theory on how a single woman chose her mate so please take this with 99% inaccuracy. Ok. Accidental illegal purchase or potentially interesting tea steeping avoided. 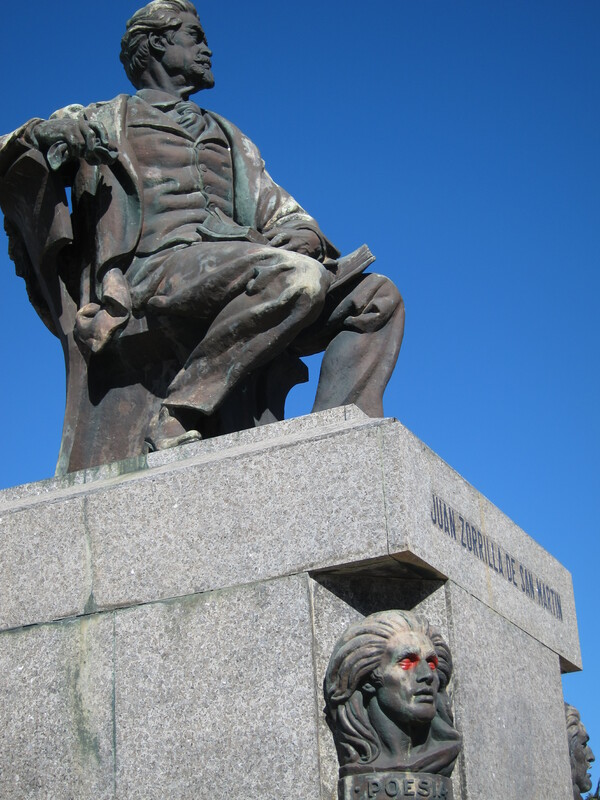 Our hotel was in an area of town known as Recoleta. Its primary attraction is a very large above-ground cemetery. I’ll let the pictures do the talking here. Then you walk around, see a bunch of plazas. There is that big wide avenue with the Washington Monument. Then more Plazas. Then some odd things. Some more things that feel like Washington DC. Sort of. Like the Casa Rosada (Rose House), which is basically like the White House, but, if you’re intelligent enough to have guessed, is not white, but rose-colored. A cab driver told us that they put a net across the roof to try to keep the politicians from getting out, but they still escape anyways. The garbage still gets out, too. And it stays out, right along-side the building for everybody to see as they walk by. This would never fly in the US. The White House is one of the most immaculate properties on the planet. 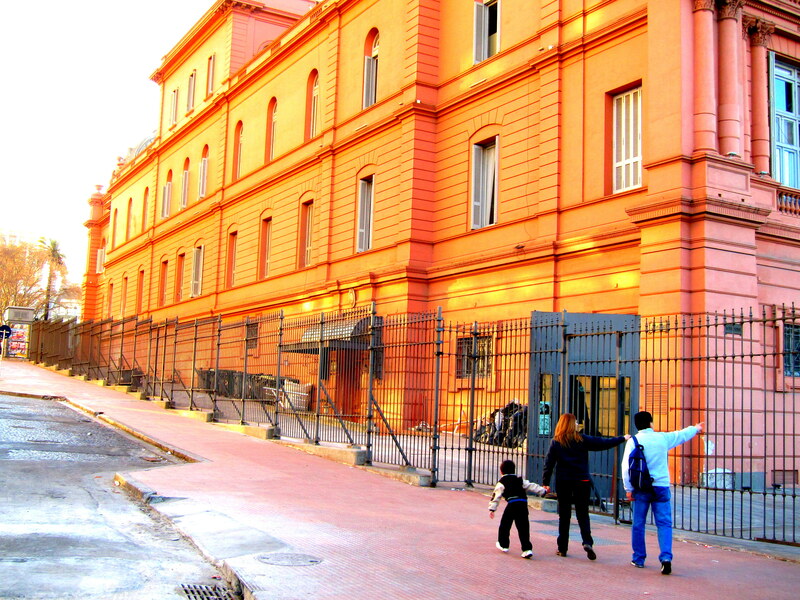 I don’t understand why Argentinos would expect anything less of the Casa Rosada. 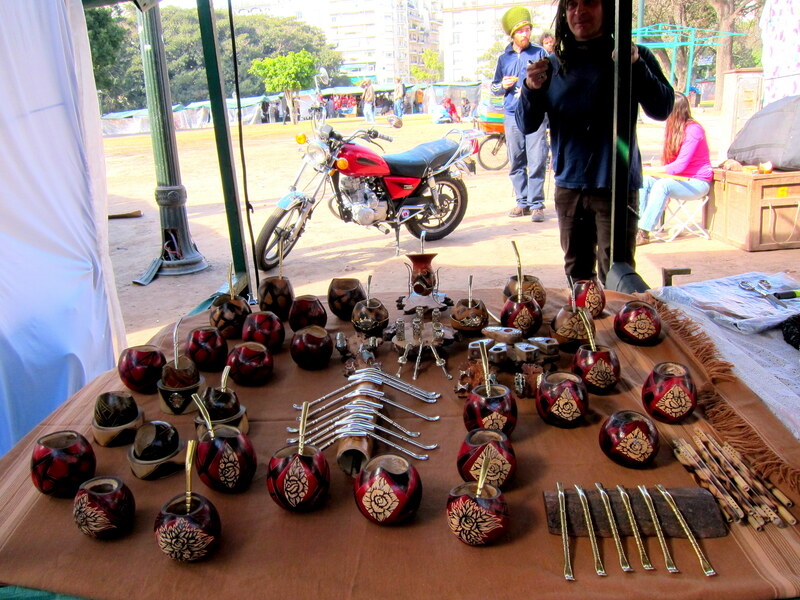 Though I’m not typically fan of artisinal crafts and street vendors, Buenos Aires had some truly amazing works displayed at markets and sidewalks. I stopped more times than I’d ever have expected to marvel the craftsmanship of some of these skilled people. Hand-carved coins for necklace pennants, incredibly small sculptures, the aforementioned mate gourds, metal sculptures, wine holders, etc, etc, etc. Oddly, being right next to a huge ocean/bay, we hadn’t see ocean for 2 days. 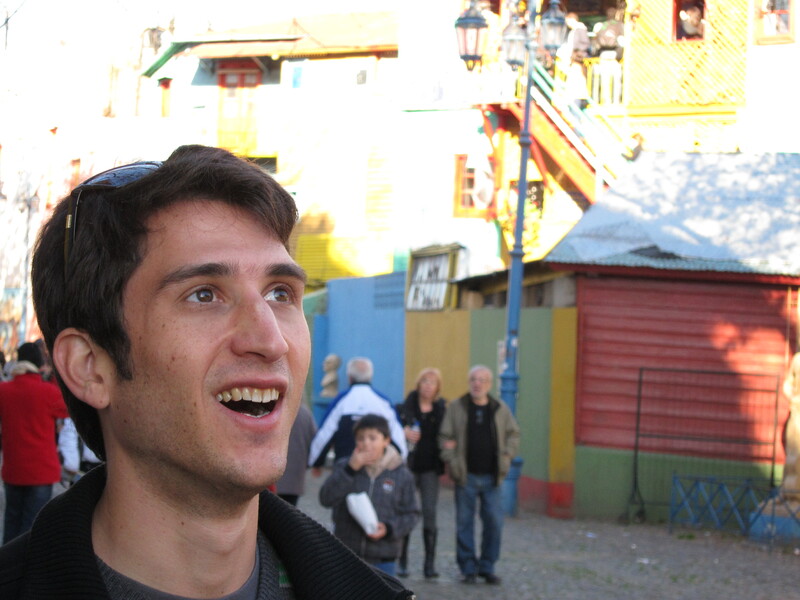 Time to remedy that – a cab ride to La Boca! “La Boca” translates to “The Mouth” which is basically like saying its a port, or mouth of a river. However, on Sunday, “La Boca” translates to “this is touristic hell and overrun with hoards of daytrippers”. It felt incredibly cheesy and I had to leave. At least we saw a couple dancing tango. 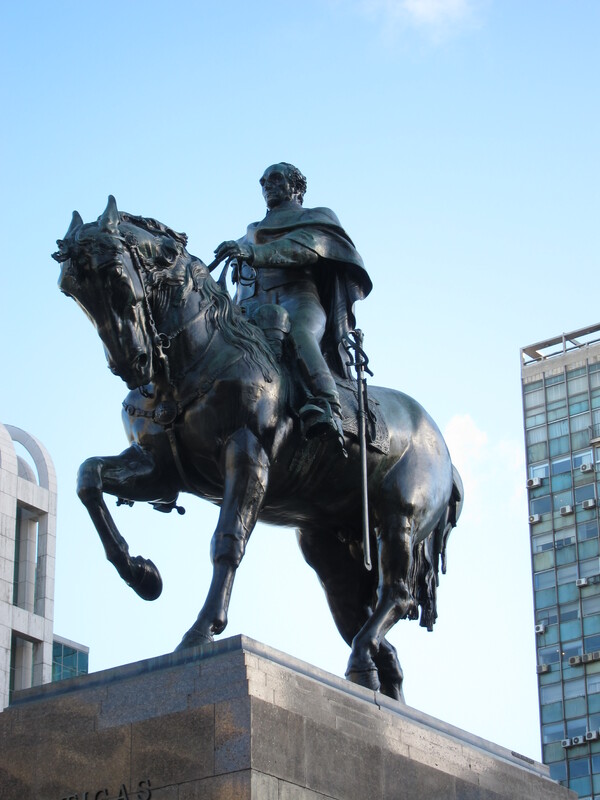 Oh, there are lots of statues of famous guys on horses. Really, drop the horse. You look like Don Quixote. I wonder if one day we will build statues of guys in their cars. Like, Obama in a Mercedes on a 70 foot marble pedestal or something. I think that pretty much wraps it up. Off to Uruguay, for now. By Buquebus ferry! We will enter and leave Argentina 4 times. 8 Stamps in the passport, total. Immigration is going to be pretty suspicious of us by the time we’re done. Alex and I couldn’t seem to find the check-in station for Pluna Airlines at the Santiago airport. Finally, we decided we should ask at the information booth. We were told “I’m sorry, Pluna doesn’t exist anymore”. What? Our airline doesn’t exist? No puede ser! I asked again – she again said something to the same effect. The airline went bankrupt two weeks ago, and there are no longer flights to be taken. They were supposed to be calling passengers to arrange alternate travel arrangements, but we were certainly never given any notice. No e-mail, no phone call, nothing. So much for basic customer service. So here we are, at the airport with a phone number of a now-defunct, employee-less airline. I bought travel insurance, but Alex didn’t. We have different credit card travel insurance coverage. So, now what? 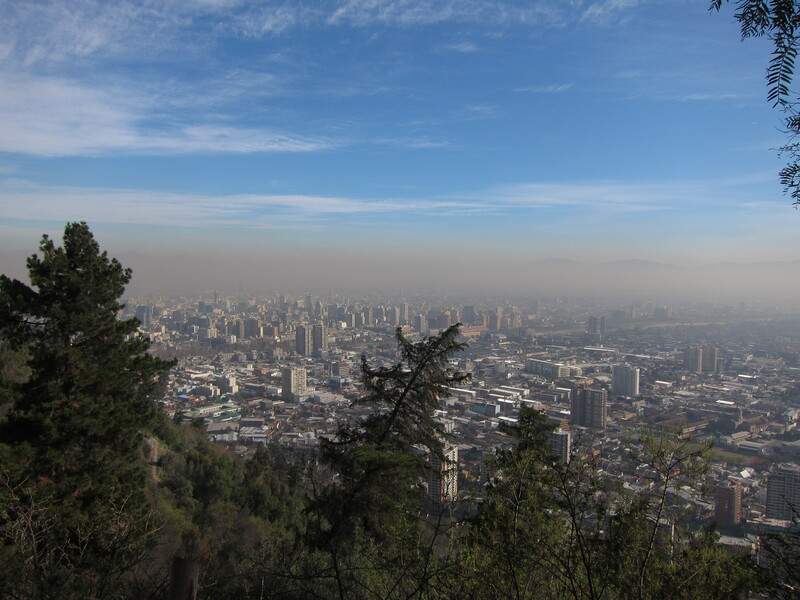 I don’t want to spend another day in Santiago trying to figure stuff out or wandering around a smoggy city. We went to a random (TAM) airline and asked how much it was to go to Montevideo or Buenos Aires. They directed us to LAN, where a very friendly lady explained the Pluna situation in a bit more detail, and offered us a round-trip flight to Buenos Aires for about $400/person. Considering the circumstances, we weren’t in a huge position to complain about that price or availability, and made the reservation which we had until 12am to decide whether or not we actually wanted to pay for. Off to a cafe with wifi. Cortado y té caliente, por favor. What does one do without internet in a situation like this? Alex called the Buenos Aires hotel to re-book it to today via Skype. I called the Montevideo hotel to cancel it for today via T-mobile’s wifi calling. For this change, we may still be charged a night penalty. I called the credit card company to see about cancelling the charges to Pluna airlines, which they seemed to suggest would be no problem. We’ll see whether or not my travel insurance or credit card covers the price difference for the plane, or cancelled hotel reservation costs or anything. So, travel disaster was mostly averted. We’re out some extra cash (thanks, Argentine reciprocity fee!) Our Montevideo/Buenos Aires itinerary seems to be reversed. We don’t yet know how we’ll be getting to Rio de Janeiro since that, too, was supposed to be on Pluna airlines. Here’s hoping we find something fairly inexpensive last-minute. This was all a very eye-opening experience. Several years ago, I was baffled when I heard that Mexicana Airlines failed, and suddenly completely stopped service. No flights were in operation, employees went jobless, and brand new airplanes sat unused, essentially seized by the government. In the US, our airlines seem to go bankrupt every 15 years or so. You could probably set your calendar year by it. However, when our airlines fail, we provide a safety net called Chapter 11 Bankruptcy which allows the company to continue to operate under a highly regulated and monitored mode. This way, people don’t lose their jobs, passengers don’t lose their transportation, and the repercussions aren’t felt throughout the hotels, airports, taxi services, and entire tourism industry. As costly, awful, frustrating and annoying as it is when companies go bankrupt, I’m now convinced that letting large companies like that fail is absolutely the worse way to go for both the social being and economic welfare of a state. Perhaps that little piece of law is part of what makes the US such a strong nation. Way to go, lawmakers & economists! So long, Santiago. And so long, Pluna. You inconsiderate and incompetent cabrones. Last night, wandering around for probably about an hour trying to find a place to eat (Santiago is in dire need of Yelp), Alex and I stumbled across a Ski trip place. We had planned on going on a ski trip – which, it turns out, would be my first time ever really skiing. On a whim, we wandered in to check the pricing. It turned out to be cheaper than the one we had originally planned to go to, and more importantly they noted that we would have to have already picked out our rental gear before the vans took off in the morning, which basically gave us time to make an immediate decision on the matter. Ski trip it is. Picked our boots, picked our coats, snowpants, goggles. Then we went in the back room and were assisted by a guy who looked oddly like Jack Black in selecting some skis and poles. He slowly worked at adjusting the skis for our boots, and haphazardly converted pounds to kilograms (which I think he did incorrectly, with some decent falls my skis never detached). Our names were written on the skis in permanent markers, and we were told to be there in the morning. We were. Along with an entire van full of Brazilians. I’m convinced that this particular outfit must have been featured in the Lonely Planet – Portuguese Edition or something. Their logo even had the Brazilian flag, and the guy helping us was from Rio. Alex and I immediately take notice of our immersion language experience, and are only more excited for the Brazil portion of the trip. Off we went, late as scheduled. Within 30 seconds of the bus/van taking off, we were already in trouble. One of the store employees was pounding on the windows of the bus, telling the driver to stop. The Brazilians made a big fuss about it and laughed. It turned out that we were running into a road sign. And perhaps even the bus behind us. A crunch and a smash later, we were un-parallel-parked later, and on our way. Thirty minutes into the trip, we began ascending the Andes. Forty minutes into the trip, we began our winding roads and hair-pin turns up to the summit of El Colorado Ski Resort. Nearly every hairpin turn was taken at roughly 30mph. There was minimal braking. There was suggestive yielding to oncoming traffic. There were very small rail guards. It seemed that every 45 seconds we were either facing running directly into a cliff, or directly off of a cliff. Each turn, the Brazilians showed us how to express fear in Brazilian Portuguese. I believe it went something like “OOOeeeeEUeoEeee!!! !” Hopefully, this knowledge will not come in handy in Brazil. I was amazed at the frenzy at the base of the slopes. Nearly all of the skiers seemed to be Brazilian. What? Why? Where are the Chileans? No Americans? Any English Speakers? Nope. Then, 75% of the skiers seemed to be about 75% of my age – and height, for that matter. This should prove to be humiliating. It was – for a bit. Alex tried showing me some basic moves. He kept talking about Pizzas and making a pizza and doing pizza turns and though I knew where he was going with it, I think it turned my mind to food and I was falling more than I was moving along any particular vector in euclidean geometry. Then he went up to actually ski, and I got my professional instructor for an hour to teach me how things are done. It turns out that he was from Japan. Masuke… Maruke… Marusake… I can’t remember his name right now. But, his English was slightly better than his Spanish, so that is how he told me basic directions. Laughing at my errors, however, was shared in a universal language. Within the hour, I learned how to sort of slow down (as much as my lanky hip flexors would allow), turn a bit, and look slightly pro while doing it. He assured me that with a few more days training, I would be ready for Olympic tryouts. Encouragement goes a long way when skiing is one of your biggest fears. So the lessons ended, I made it down the big bunny slope hill without dying or piercing my instructor, who encouraged me to press my ski poles into his chest while he skiid backwards and slowed me from flying down the Andes at 800kph. Then, Alex had the fortune of skiing with me. More like spectating, I guess. And he photographed me – while skiing backwards. Then videotaped me, while skiing backwards. At some point, he caught me skiing ever-so-overly-fast, directly into a “slow down” sign, thus knocking it over. Oh, the irony. So we had some breaks. Alex went off to do real skiing while I did my best to not die. I succeeded, and I even started to get the hang of it by the end. My hip flexors and back said “thats enough”, as did my watch. Brazilian’s watches run precisely 10 minutes slow. We sat on that bus, waiting for everybody to get back on at the designated 5pm. Nobody… nobody, nobody….. then, 5:10pm and suddenly 20 Brazilians pile onto the bus at once. It turns out, I don’t even think they were a big group of people who knew each other – its just how it is. We went down the scary hills and switchbacks, which at this point was actually quite slow from all of the ski-evacuation traffic. Again, we did not fly down or into a cliff, despite the driver’s numerous attempts. The day was a success, ended by a rather disgusting Chilean sandwich. I wonder if this is how many Chilean’s days go. They have fairly terrible food here in Santiago. Lots of hotdogs, hamburgers, and other nasty things. Figuring it seemed to be the national cuisine of Chile, we went for one of these things after the trip. I got a vegetarian equivalent of “El Completo” which normally carries a hot dog – but in my case they just removed that integral ingredient. Mushrooms, onions, peppers, about 2 cups of guacamole, 1 cup of mayo, all slathered into a hot dog bun. It was the messiest, most mediocre and fulfilling thing I could have eaten at that moment. I was hungry. Tomorrow, I expect to have cholera. Chilean Merlot, some craft beers, some chores of doing laundry, and a long skype chat with Alex’s girlfriend, Lindsey, ended our last night here in Chile. Tomorrow, we are off to Montevideo. So long, oeste de America del Sur! Santiago. 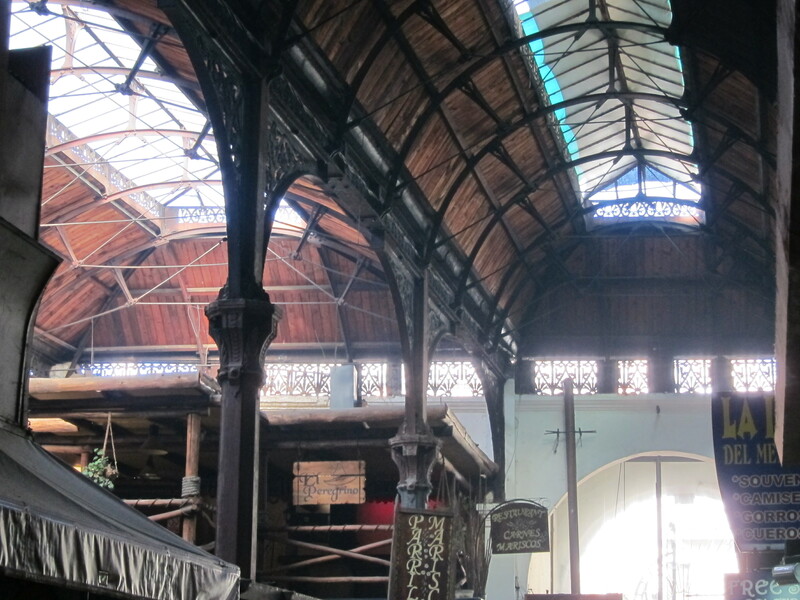 It was interesting to arrive into a large bustling metropolis after a quaint colonial city like Valparaiso. It felt like we were in New York. Or Mexico City. Or Barcelona. It felt like everywhere, but different. It was night-time when we arrived. The metro was super clean and quiet and efficient. When we submerged from the underground, people were out and about on the streets everywhere. The streets seemed pretty clean and the buildings well-kept. There wasn’t dog poop everywhere, which was an improvement over Valparaiso. 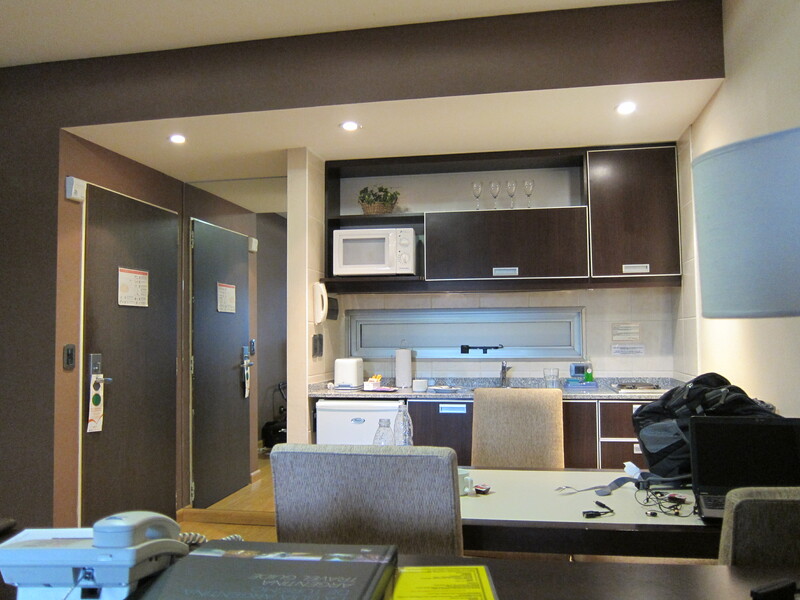 We got to our trendy, tiny apartment – though it was substantially more roomy than our hostel which had room for two bunks and a bean-bag chair, but that’s about it. We walked around forever trying to find a restaurant, but nowhere seemed to be serving food. Chileans eat late, but it was already fairly late and still everywhere seemed to just be cafés. People drinking beer or coffee, but no food. Oh well. We found a cool little pizza place that knew what they were doing, bought a bottle of wine and chilled at the apartment for a while. Pizza always feels like such a cop-out. Sometimes, it’s just what you need. The next morning we woke up decently early to walk around the city. The first thing we noticed was the smog. Mmmm… smokey. Alex felt like he was back in Beijing, but I was reminded of DF, Mexico. 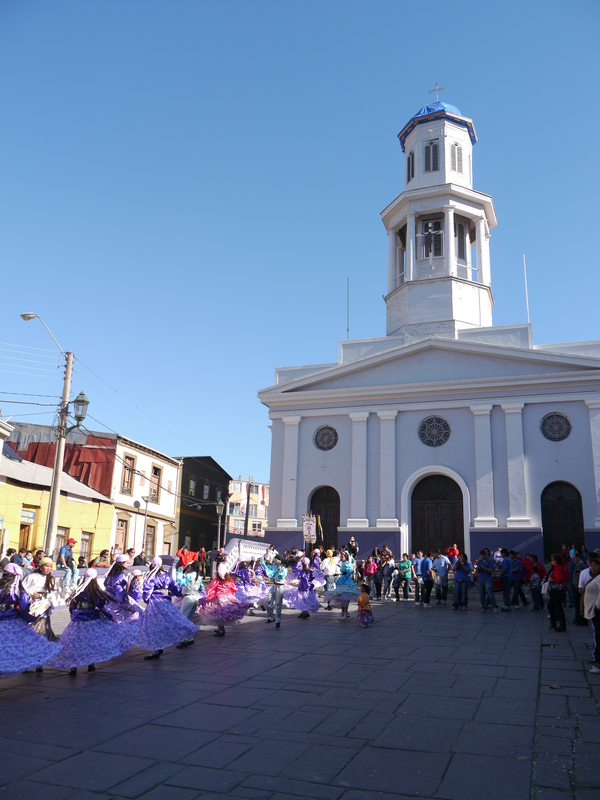 Santiago is located between the ocean and the gigantic Andes mountain range. Essentially, the moisture and warmth from the ocean traps a layer of smog in the valley, and it is disgusting. 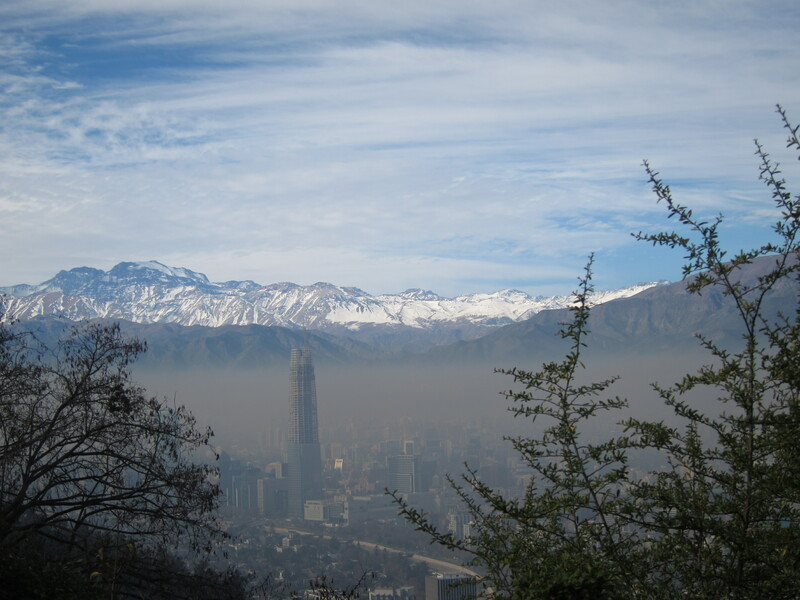 Anybody who doesn’t think that humans are capable of changing climate needs to spend a couple of weeks in a place like Santiago. When your snot turns black and you constantly feel like you have the flu from a sore throat, you realize just how much our polluting vehicles and factories really affects the environment we depend on. There are mountains surrounding Santiago. You can’t see them, despite there being 10,000ft peaks just a few miles away. Part of this is because you’re nearly always surrounded by highrise or midrise buildings – similar to the claustrophobia feeling in New York City. If you do catch a space to peek through, though, it doesn’t matter. The smog blocks the rest of that view. Lovely. Walking around, Alex was excited to try some good coffee from South America. It turns out that there is some phenomenon called “café con piernas” or “coffee with legs”. Basically, think of Hooters, but instead of serving food tha baristas wear somewhat scandalous outfits and serve coffee to lonely old business men. Its pretty disgusting, and horribly machismo, but we had to go. At first, like any such establishment, we felt dirty for even opening the door. But then, half the businessmen walked out and then some women came in with their kids. I guess café con piernas is a family destination as well. We walked around some plazas. Plaza de Armas. It should really be called Plaza de Hotdogs. Santiago has some of the most disgusting food I’ve come across in all of my travels. Nearly everywhere seems to have signs to boast their sandwiches – be it hot dogs or hamburgers or sloppy meat sandwiches with who knows what kind of meat piled over the sides of boring bread that could put the most overdone Arby’s sandwich to shame. Oh, and the mayo. SO MUCH MAYO. On everything. Cups of mayo. Mayo could give the hotdog a run for the official food of Santiago. Back to the plazas and city. Plaza de Armas has an entire side of a block dedicated to hotdog stands. Each hot dog stand seems to offer exactly the same things as the stand next to it. Some stands are clearly more popular than other stands. What sets them apart, we’ll never know. Just a few blocks away exists a very similar phenomenon where on a single narrow street, there are around 20 or so very small small appliance repair shops. Each one displays its replacement blender pitcher arrangement proudly in a glass case, along with various other parts. It would seem as though all they could possibly repair were blenders, but some had other random appliance parts from can openers, coffee makers, hair dryers, and other small appliances that would never ever ever be worth your time and money to repair. But there they were, all doing exactly the same thing, competing with their immediate neighbors for the same business. In the neighborhood which we stayed in, Bellas Artes, there seemed to be maybe one restaurant within blocks to eat at. Everything else was cafés. It was the Café quadrant. In Bella Vista, just across the highway, there were tons of restaurants and some bars, but not so many cafés. A few blocks from that were sketchy bars and nightclubs, but no restaurants. The layout reminded me of how I’ve heard of Brasilia described. Restaurants in one quarter of the city, hotels in the opposite quarter, and shopping in some other quarter, with a taxi required to get in between them all. 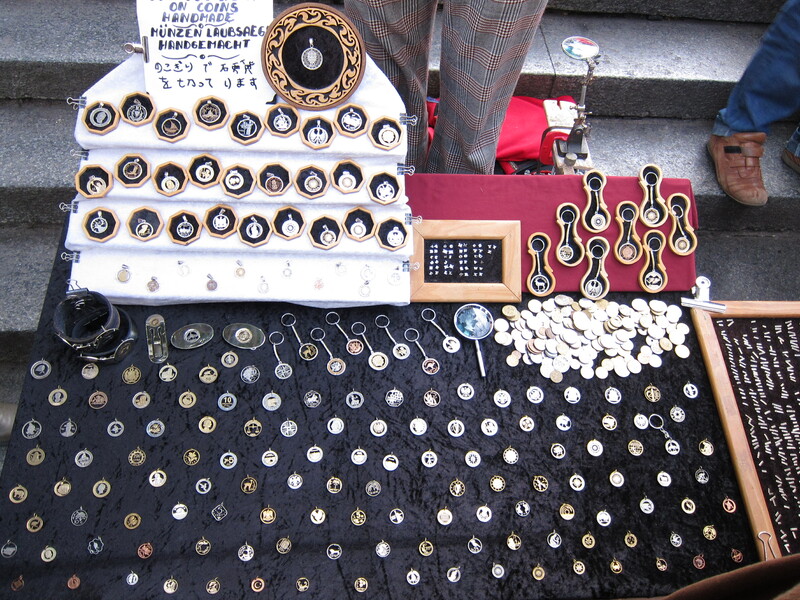 Santiago may not be quite as bad, but its not so great to just wander outside of your hotel and find great things. and basically stopped mid-sentence and shook her head because she thought we weren’t worth the time and were clearly so uncultured that we wouldn’t know what culture was if it smacked us in the face. We learned a bit about Chilean security guard culture, and decided it was time to immediately leave. We climbed a hill. Then we climbed a bigger hill and took a funicular down. You might think this was the wrong order, but if you saw the line to take the funicular up, you’d agree with our decision. To the grocery store. 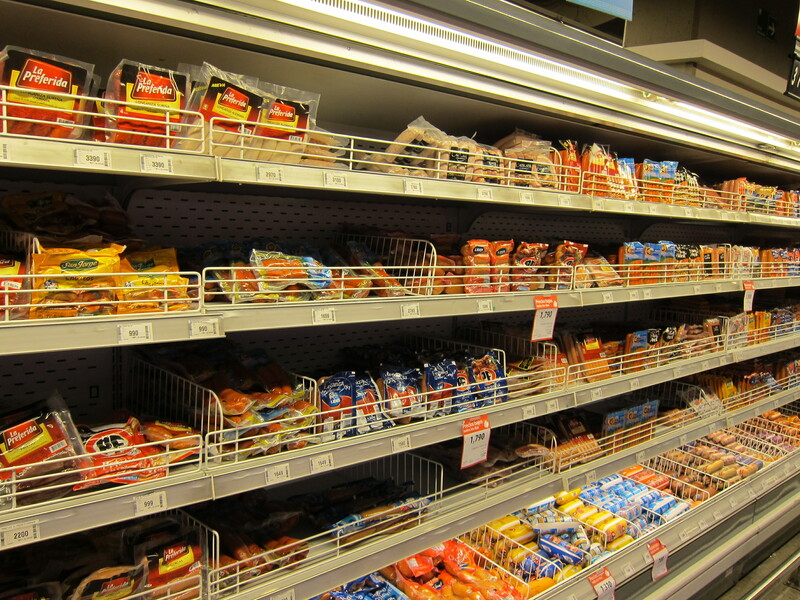 I took a photo of the hot dog aisle. My friend, Christine noticed this photo and said she took the same photo. She did. And she wrote a gerat article about hot dogs in Santiago here. 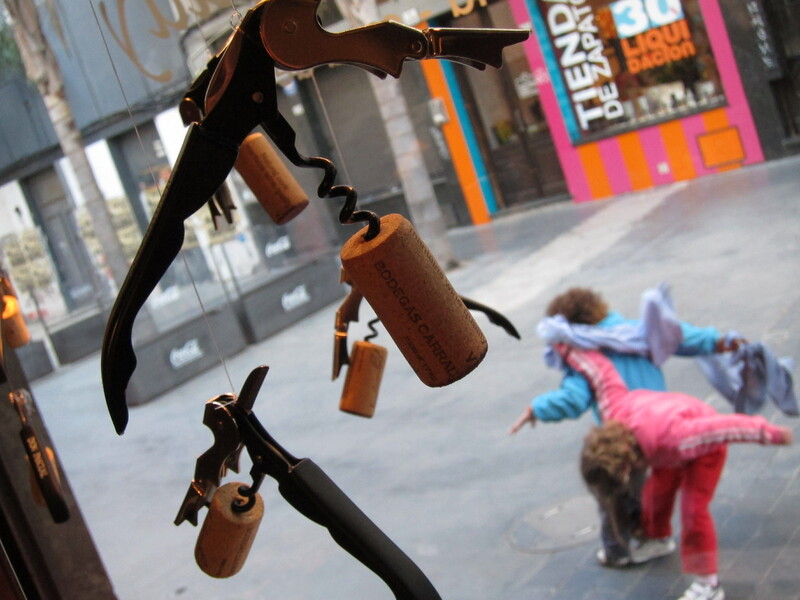 We picked a bottle of delicious and inexpensive Chilean wine. Some cheese. Breakfast things – because we decided we could do a better job cooking eggs and placing them on bread than any non-existent non-hotdog-breakfast-stand could hope to. (which, it turns out, Alex did quite well at). We went through the checkout line, which was of course slow and obnoxious, and then required me to return to the back of the store to weigh the bread we had placed in a bag, despite there being a scale right on the checkout counter in front of the cashier. Slow. But then, it was all made up for when the supermarket music switched to the next track – Careless Whisper by George Michael. The girl bagging our groceries started giggling, and told the cashier “la canción!”, pointing to the overhead speakers. Alex and I also began to laugh, knowing exactly what it was that was so entertaining. “Por el video Youtube?” Sí. Some things are funny no matter what hemisphere you are in. I don’t know what to say about Valparaiso other than that it is probably one of the most picturesque cities I have ever been to. Taxco, Mexico may be a very close contender. They are both UNESCO heritage sites. If you don’t know what UNESCO is – I suggest you look up their list of cities worth visiting. They are. We expect to see a few more on this trip. A roller-coaster taxi ride by a crazy cab driver who was tired of being stuck in traffic and wanted to show us how his car could handle cobblestone streets that have a 45degree grade. Arriving at our wonderful hostel, Adlafken and being greeted by several people. The main lady was a fantastic host, who would often be found wearing a surgical mask and speaking in words faster than we could possibly understand. Taking terrifying funiculars up very steep grades to get from A to B to C to D. They were fairly cheep – about 60 cents for the more expensive one. Being there on a national holiday which nobody seemed to have any idea why it existed, other than “algo religioso, no se”. It did end up involving some people dancing to some horribly repetitive music in front of a church, and then some procession of some military guys up a big hill which we watched a few minutes of, then became a part of, then ran in front of to avoid. 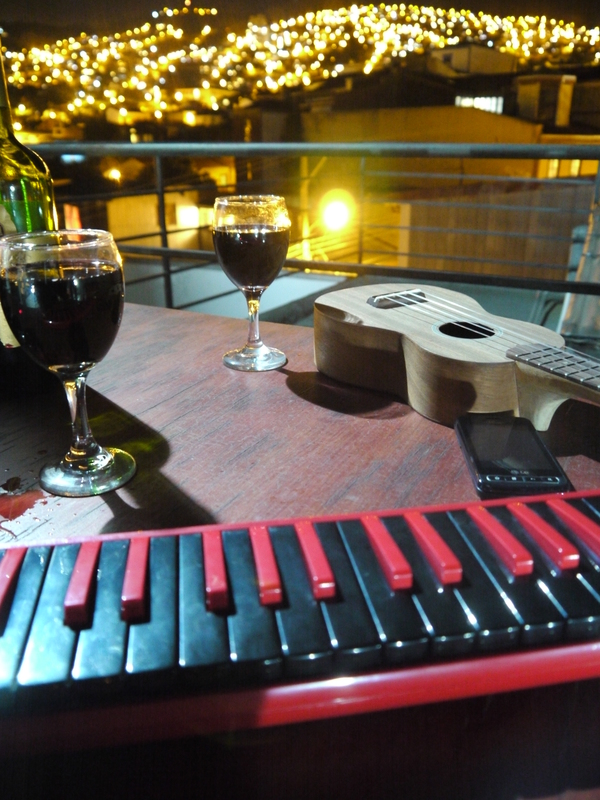 Playing music on top of an amazing rooftop terrace at the hostel. Yup, that pretty much wraps it up, I think. If I had to pick one question to never hear again in my life, I think it would be “So, are you all packed?” The only time that somebody could ask me this question and hear an affirmation is if you are in the car with me on the way to the airport. As anybody who’s traveled with me (or been unfortunate enough to be near me before traveling) may know, packing stresses me the hell out and tends to bring out The Hulk in me. Over the last few years, I have slowly created and added to a huge packing checklist in Google Tasks to try to eliminate some of the confusion and worrying that I may miss something. It helps to a point, but at the same time the mere site of the list can be daunting. Regardless, having to get all of my digital life in order on top of physical things ads an entire new level of bit-packing that seems to just take longer and longer. Did I copy all of the movies I want to watch on the plane? How about music I may want to listen to? Did I unlock my cell phone? Download offline maps? Get a translation app? Dictionary? Ebooks? Spotify sync? Windows updates? GAAAAAH! After a night of drinking some beers and getting late night food with some close friends, I finally calmed down a bit and could do my general packing. Literally, by bags weren’t packed to satisfaction until about 5 minutes before my ride to the airport arrived. Alex and I had a flight that left Austin at 7pm on a Saturday. I realized this may be my favorite time to travel. The airport was nearly desolate – no lines at security or anywhere, really. We grabbed a nasty veggie burger for dinner, walked over to the terminal and right onto the plane – despite us not being late at all the plane had almost entirely boarded and was quite empty. Off to Dallas. Insert indifference sound here. The next flight to Santiago would be 9 hours long. It was in a very outdated 1970’s American Airlines tin can edition 767. Entertainment features included 5 15″ CRT televisions, and we were lucky enough to have power in our seats – except the power was a cigarette lighter plug. The plane did not experience sudden depressurization or faulty engines on takeoff, cruising, or landing. This may have been a small miracle in and of itself. At which point they hand me a decently sized bottle of delicious Merlot Cabernet blend from France. Why couldn’t they just read me the bottle? Or show me the bottle? The fact is, I actually did have the choice between grape types. I guess I must be the only person to ever fly on an airplane that would pick a wine based on the varietal, and not the color. I wanted to know what would pair with my 5 forms of cheese and carbs that were on my plate. 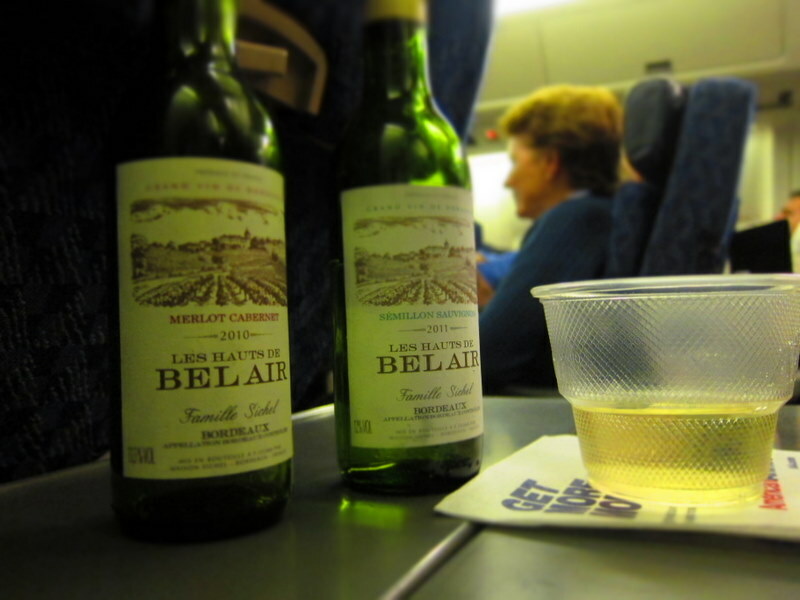 The wine was way too good for an airplane. I got the white too. So, lesson learned, when they offer you choices of free wine on an American Airlines flight, the correct answer is “both, please”. Some 9 hours after taking off , we had breakfast of cheese and carbs, and quickly found ourselves landing in Santiago de Chile. Finally, we are here. Alive. Upon de-boarding, we were shocked to not see any guys in berets holding fully automatic weapons to greet us. Are we in Latin America? Concerned. Baggage took about 45 minutes to show up on the belt after we had already spent 45 minutes getting off the plane and going through customs. Confirmed: we are in Latin America. Just a bus ride and a bus ride and a traffic-jammed then rollercoaster cobblestone taxi ride away from our hostel in Valparaiso. Today’s weather is less than stellar. 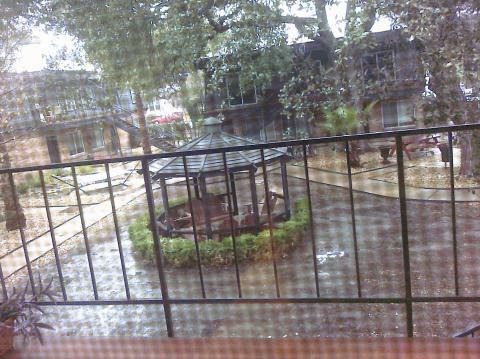 Either the rain has washed away or simply hilighted the complete lack of grass in the courtyard. There are plans to replace the ground covering in the spring. Until then, this is my view and front lawn.